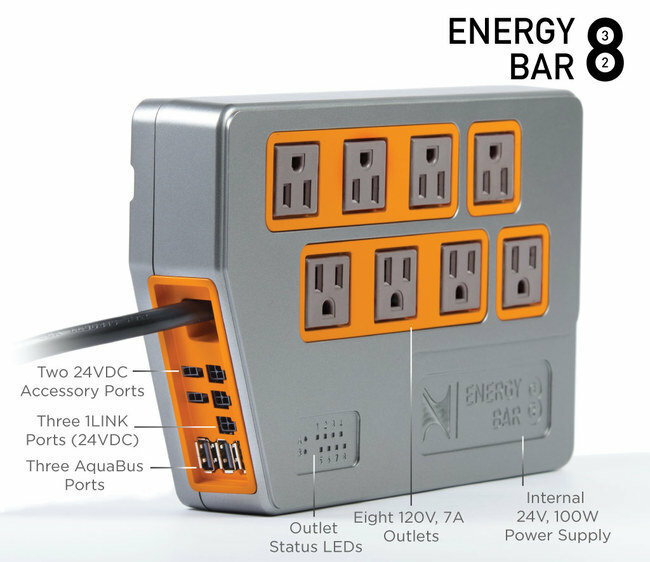 This Energy Bar has a built-in 100W, 24VDC power supply that can control up to three Neptune Systems 1LINK products like the WAV and DOS. It also includes two switchable 24V DC on/off outlets that are compatible with any 24V device under 30W and Neptune Systems 24V accessories like our Practical Multi-purpose Utility Pump (PMUP). Since the Apex is receiving continual power usage data from the Energy Bar 832, it can be configured to send you notifications when a device is not using power as it should be. An example would be a return pump showing no power consumption when the outlet is on or a skimmer whose power consumption will show differently when its airline is clogged when compared to normal operation. These high and low limits are completed customizable by individual outlet. You can even use this power data to control other devices. Times have changed and it is fairly uncommon now for aquariums to have AC devices that must be cycled on and off continuously. This means that we could now switch all AC outlets to relay switching since there is no need to have soft start and there is no concern for the noise of the relay.